Image above: the chapel of Our Lady of Sorrows Shrine in Starkenburg, Missouri. the 1-day pilgrimage will join the 3-day pilgrimage at Portland, MO on the morning of Saturday, October 17 for the final 12.5 miles. 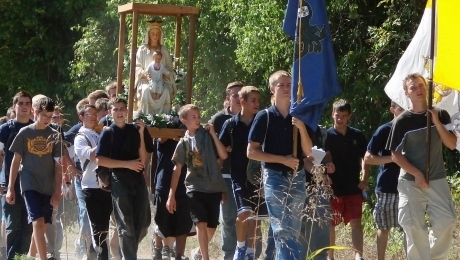 Please sign up if you are going to make the Starkenburg Pilgrimage. Auriesville injustice: "Rome will hear of this"
We turn to Our Lady!